The members of the Hedman Performance Group welcome you, and congratulate you on your recent success at one of the Contingency Connection's participating tracks across the country, or Engine Builder's Event. HOW TO REDEEM YOUR RACER BUCKS! New, Simplified Redemption Process. Please Read! To redeem your Racer Bucks, you will need to download the appropriate coupon redemption form(s) from below, to match the coupons you earned. Browse our website, or click a catalog link from below to thumb through our flip-style catalogs to locate the product you wish to receive. Enter the desired part numbers in the product order section of the redemption form. Hedman coupons can ONLY be used for Hedman Street Product (not for Hedman Husler, Trans-Dapt or Hamburger's product). 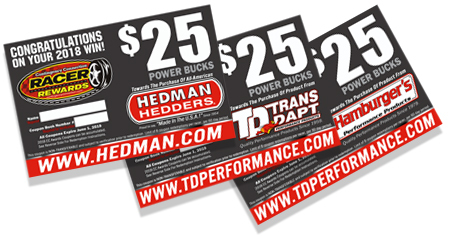 Trans-Dapt and Hamburger's coupons can be combined for use on any Trans-Dapt or Hamburger's Product, but cannot be used for Hedman or Hedman Husler product. A maximum of 8 coupons can be redeemed within a 60 day period. Determine your product's pricing by opening the special price book link located below. Enter the pricing from the book on your redemption form. Total your product order amount and enter the total of your coupons on the redemption form. If your order total surpasses the value of your coupons, selct a payment method in the PAYMENT METHOD section of the redemption form and follow the instructions for that payment method. If you choose to pay your unpaid balance using a credit card, download and complete the appropriate credit card authorization form (Hedman or Trans-Dapt/Hamburger's), and submit it to one of the secure delivery methods noted on the authorization form. If you have any questions about the Racer Rewards Redemption Process, or you wish to follow up on a submission previously made, please email lauraf@hedman.com. If you have any Technical or other product questions, please contact our gearheads in the tech department by emailing them at techsupport@hedman.com, or by phone @ (562) 921-0404 M-F 8am - 4:30pm Pacific Time.